Those four solstice days will shift no more than a day over four years as a result of leap days, Dr. Tyson wrote. But the shift is so small that if you went out only on these dates, you would see the effect just fine. "In fact the effect is good for a day on either side of the advertised days, typically offering a range of weather choices for the avid viewer," he wrote. As for the sunset next Sunday and on July 13, Dr. Tyson wrote, the sun will line up on the center lines just as its falls halfway below the horizon. The official sunset, when "the sun's last smidgen sets below the horizon," lines up on slightly different days, but this one makes for a nicer photo. I do hope the clouds stay away. I've known this for quite a while, but choose to believe the actual date is May 27 - my birthday. The solar system is off by one day, reinforced by the fact that my sister's birthday is Dec 04. You can get astronomical data for any date at the US Naval Observatory website. On the link Sun or Moon Altitude/Azimuth for One Day, the sun or moon transit is tracked from rise to set. Azimuth is the degrees along the horizon clockwise from true north. Altitude is the degrees above the horizon. To find exact sunset, note zero degrees altitude. The time is shown as EST, and the azimuth locates the position on the horizon. Official sunset occurs when the upper edge of the solar disk is at the horizon. In the case of May 28, 300 degrees azimuth lines up with the Manhattan grid. If you substitute 26, 27, and 29 as the date, you can see that the effect lasts for several days. 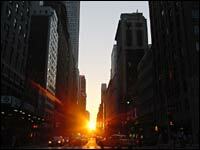 A consequence of the strict grid plan of most of Manhattan, and the grid's skew of approximately 28.9 degrees, is a phenomenon sometimes referred to as Manhattanhenge (by analogy with Stonehenge). On separate occasions in late May and early July (for 2006 the exact dates are May 25 and July 17), the sunset is aligned with the street grid lines, with the result that the sun is visible at or near the western horizon from street level. A similar phenomenon occurs with the sunrise in January and December (January 11 and December 2 in 2006). Danny's Wedge of Light at Ground Zero is tied the September equinox that was to illuminate the footprints each Sept. 11. There was of course considerable disagreements on the accuracy of his calculations. Nonetheless the new WTC PATH station is situated at an angle to accomodate the wedge. 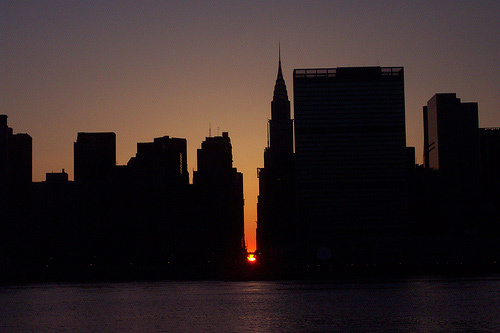 More Manhattanhenge photos by Marcus on Flickr. Thanks. Mac's photos were awesome also. There were 30-40 people on the Tudor City bridge photographing the big show. That photo shows the sun perfectly aligned with the center line. However the sun actually set slightly to the right. It sets on the center line on July 12. See article for Flash presentation of photos. Fantastic!! This weekend was “Manhattanhenge,” a term popularized by Neil deGrasse Tyson, the director of the Hayden Planetarium, to describe the solar event where the sunset is lined up with the east-west streets on Manhattan’s grid. Mr. Tyson argues that this is perhaps a unique urban phenomenon in the world, if not the universe. The biannual event has become an urban photographer’s dream, allowing towering edifices to bask in a warm soft glow in the last 15 minutes of daylight as the sun sets right down the middle of the city’s streets. The best views, predictably, are the major cross streets in Manhattan: 14th, 23rd, 34th, 42nd, 57th, among others. Crowds, armed with cameras, gather on the eastern avenues in Manhattan — First and Third are particularly popular. This year, security surrounding the Obamas’ date night on Saturday briefly disrupted the photographers. The pictures above were all taken this weekend. Manhattan’s grid, adopted by the city in 1811, is set 28.9 degrees east from due north. If it had been aligned due north, the effect would be seen on the spring and autumn equinoxes, when the sun sets on the east-west line. Instead, because of Manhattan’s tilt, those now take place about three weeks before and about three weeks after June 21, the summer solstice, the official beginning of summer. On Saturday, May 30, around 8:17 p.m, the sun was half above the horizon, half below. At the same time on Sunday, May 31, the full sun was visible just above the horizon. Lest you missed this one, never fear. The next one is just weeks away — on July 11 and 12.